After I replaced my daily coffee with a matcha I noticed plenty of benefits. I fell asleep easier and slept better. I felt less anxious and jittery. I felt more mentally sharp after my morning matcha instead of the feeling of doing nothing more quickly that coffee came with. I wasn't sure what the reasons behind these feelings were, I started drinking matcha because I fell in love with the taste. But was it just the absence of coffee that was making me feel better or the presence of matcha in my routine? 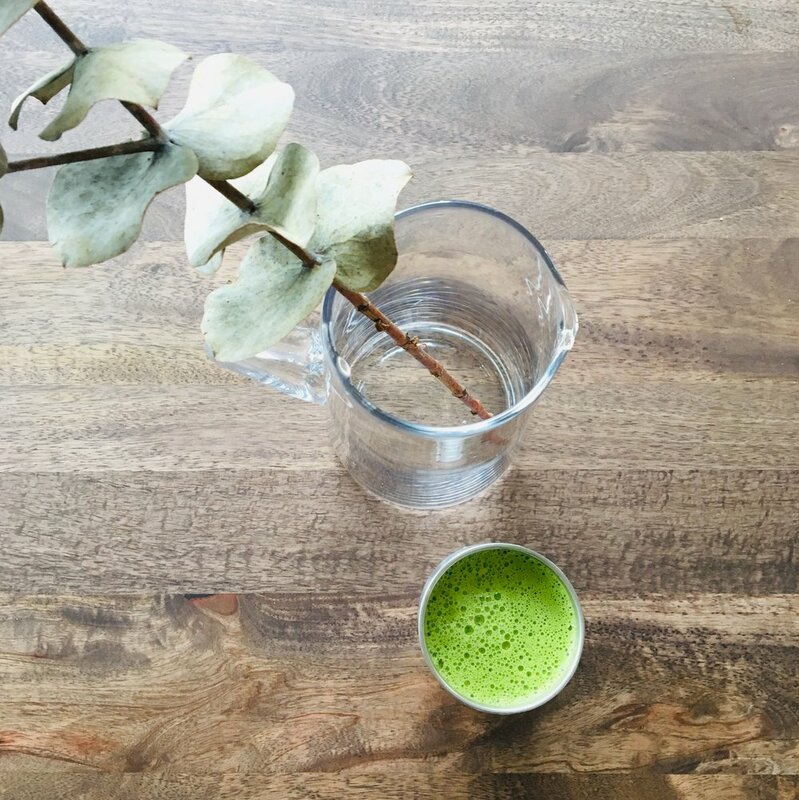 The green powder is made of 100% young green tea leaves, so when we have our warm or cold green drink the whole plant is consumed not just an infusion which means a much higher level of antioxidants. Matcha has around 25mg of caffeine, a cup of brewed coffee around 100mg. Matcha contains L-theanine which is an amino acid found in green tea leaves. This compound has been shown to improve focus, deepen relaxation and improves sleep quality. It boosts levels of feel good neurotransmitters GABA, serotonin and dopamine. This is great news for people like me who are chronically struggling with low moods so a boost in feel good chemicals in the brain is very welcome. These neurotransmitters not only play a role in mood but also sleep, concentration, alertness. Cognitive tasks are also improved by L-theanine which is why having a cup of matcha instead of coffee on a day when you really want to get some serious work done is a great idea. My sister experimented with taking L-theanine capsules after drinking coffee to see if it balanced out the negative effects like jitteriness and bad sleep but didn’t notice much change. Of course we are all bioindivideal so what works for one person might not work for another. But for me I concluded that it was taking coffee out of my day in conjunction with adding in matcha that made me reap the benefits. I’ve had many first hand responses to having matcha that it just doesn’t taste good to them. I’ve talked about my mixed first time matcha experience in this previous blog post. Here are a few tips to help you navigate a matcha ritual of your own. Matcha powder can seem pricy but you only use half to one teaspoon to make a cup. Get a brand that was recommended to you by a matcha lover so you know it will be good. For some reason I’m not a fan of matcha with dairy and I don’t by or consume milk so I tend towards plant based milk options. I’ve talked about blending my matcha with raw cashews in the past which is a great option because the nuts add a subtle sweetness. Currently since the weather has cooled off for fall here in Canada I needed a change so opted to change back to coconut butter. This Artisana version is the one I always get purely because the grind is much finer and I hate the mouth-feel of a gritty cup of matcha. If you feel like it start drinking matcha with some honey or maple syrup. Honestly I’m not a fan of sweetened matcha, maybe this is due to the reputable umami savoury flavour of the tea leaves. But many people have been initiated into matcha with a little sweetness so try it out, you can always reduce it as you fall in love with the taste. Some people love fancy additions to their cup of matcha like cinnamon, vanilla bean, pumpkin pie spice, cardamom. Personally I just love the green taste of the tea and haven’t enjoyed it as much when other flavourings are added. Other high flying options are adaptogens like cordyceps, reishi, lions mane, etc. I talked about this more in my adaptogens post here. But if you truly don’t love the taste why force it? If it’s not a “hell yes” then it probably should be a no. For me right now, I’m sticking to a teaspoon of matcha, hot water (not boiling) and a tablespoon of coconut butter blended in my vitamix for a creamy dreamy cup that wakes me up in the morning but leaves me feeling chilled out and not jittery. There’s some more great information on matcha and L-theanine that can be found here in this Psychology Today article.